The best way to introduce one’s self to the Witcher Series is not by reading the first book Blood of Elves, but rather The Last Wish, Sapkowski’s first collection of short stories about Geralt the Witcher. By reading the six short stories found in this collection, readers are introduced to so much about this new fantasy world and to many aspects of the Witcher III: Wild Hunt, for all of the events that happen in these stories happened BEFORE the events in Blood of Elves. 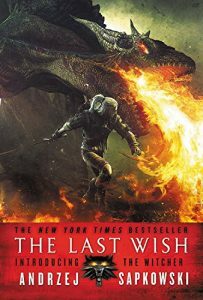 Synopsis of The Last Wish: Geralt of Rivia is a witcher: an inhuman being that has been molded and mutated into a monster killing machine. 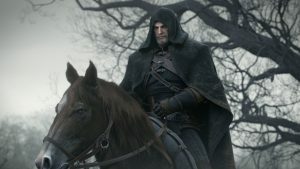 Witchers are hired to protect villages and kingdoms and to kill the monsters normal humans don’t stand a chance against. After having been nearly killed during a recent assignment, Geralt takes refuge in Melitele’s Temple to heal. While there, he reminisces about different adventures and assignments he has had in the past. For this first collection of short stories, references shall be separated by the order the stories are laid out and players will be seeing many significant details that are referred to at some point or even at multiple points in the game. Feel free to pick and choose whatever you would like to read if you do not wish to read the whole article, for I did write quite a bit. However, if you do decide to read it all, let me just say right now, thank you. So, without further ado, let us begin. For those of you who have only played the games up until this point, do you remember the opening cinematic to the first Witcher game? The one where Geralt faces off against the striga? That opening is a very brief retelling of the first story ever written about Geralt. After being submitted to a short story writing contest in 1986, Sapkowski released his first published work “Spellmaker”[i]. At the start, Geralt of Rivia was known as a Spellmaker, acting more as a magician who killed monsters than the fighter we know now. 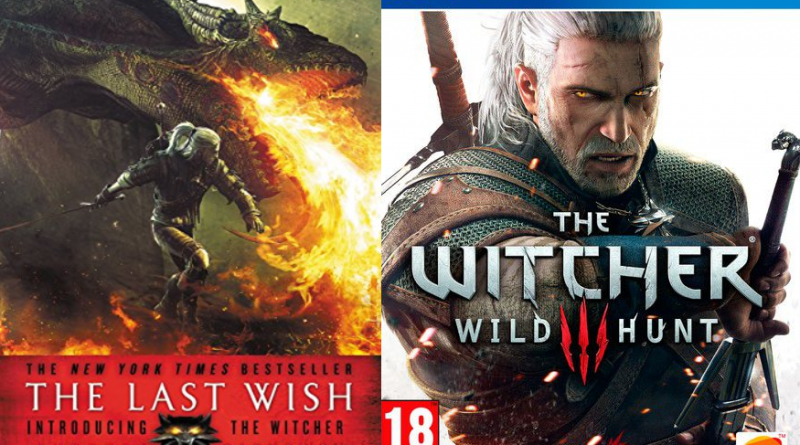 It wasn’t until 1993 when Geralt officially became a Witcher in “The Witcher.” Both “Spellmaker” and “The Witcher” are the exact same story, but with very minor changes between the two (see comparison between Sapkowski’s “The Witcher” in The Last Wish[ii] and “Spellmaker” found in Michael Kandel’s A Polish Book of Monsters[iii]). While I did mention I would not make book references from any other game, this will be an exclusion, for it is the very first story readers will most likely come across when being introduced to the Witcher, whether one is reading The Last Wish or playing the first Witcher game. I must point out that the game does have an inconsistency with the written story. The first game says that Princess Adda was the one turned into a striga… which is not true. Princess Adda was King Foltest’s sister. Foltest fell in love with her and the two had a baby (of course, it’s medieval times… who wouldn’t expect something like this). The BABY turned into a striga and the people believed it to be a curse for Foltest sleeping with his sister. In “The Voice of Reason” before the second short story, readers are first introduced to Nenneke and the religion around Melitele,[iv] whose name also appears a few times within the game. While this reference to Nenneke is the only one found in the Witcher III: Wild Hunt, she is an amazing character to read about. She acts more like a mother figure to Geralt and while she is a priestess in a temple, she has quite the fiery temper, making her a woman no one would want to cross. This just adds another reason among many to read the Witcher books, for Sapkowski only writes powerhouse women characters: no damsels in distress present here. Nenneke has also known Geralt since he was little. “When I met you, you came up to my waist.”[v] Makes one wonder if the priestess knew Geralt before he trained to become a Witcher and how many times she truly has patched him up since she first met him. Not to mention in the books, Geralt is nearly a century old, so how old is Nenneke, truly? Once readers get past “The Voice of Reason” and into Geralt’s second memory of the book, readers will be introduced to a fun aspect of Sapkowski’s writing: fairy tales. Sapkowski refers to numerous well-known fairy tales. The ones in The Last Wish include “Snow White and the Seven Dwarves” (in the story’s case, “Seven Gnomes”),[vi] “The Princess and the Pea,”[vii] “Cinderella,”[viii] “Rumpelstiltskin,”[ix] “Three Billy Goats Gruff,”[x] “The Pied Piper,”[xi] and The Arabian Nights. “The Golden Goose” has to be rescued from dwarves when taking an optional side quest from the bulletin board in the town. “Thumbelina” can even be found and this one I stumbled across by accident. While traveling from the town, before reaching the three pigs, you will come across a very small town. While wandering through this town, you will hear a small scream and Syanna will say that you stepped on Thumbelina. This was actually a really funny reference I discovered. The last I found is actually a Polish fairy tale called “The Musicians of Bremen” that features a rooster, a cat, a dog, and a donkey. When you find these four animals stacked on top of each other (found close to where you fight the wolf from “Little Red Riding Hood”), these are those animals from the tale, though the game changed the name of the tale to “The Musicians of Blavikan” which ties to another Witcher story that will be touched upon later on in the article. “A Grain of Truth” is also the first story to introduce an intriguing aspect of Geralt. While he slays monsters for money, he will not slay ALL monsters for not all monsters are monsters. 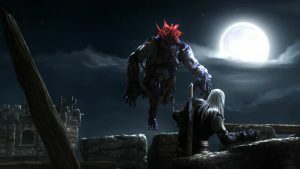 From the outside, these creatures may look like monsters, but Geralt sometimes comes across a “monster” who is actually a cursed human or has a broken spirit that is in need of mending and, rather than just killing them, he goes against what others believe of his trade and does what he can to help them. This feature of the Witcher’s is mentioned numerous times while playing through the Witcher III: Wild Hunt and it is an admirable trait, especially in a tough character such as Geralt. Geralt comes across one of these cursed monsters for the story of “A Grain of Truth” has a subtle hint to the fairy tale “Beauty and the Beast,” where a young boy is turned into a bear-like creature and is looking for a woman to love. However, Sapkowski puts a twist on the story for rather than a beauty, a bruxa is trying to make him love her. “The Lesser Evil” story houses two things players will most likely remember from the game. The first comes from the “Killing Monsters” cinematic trailer for the Witcher III: Wild Hunt. This trailer is what sold me to play the game, for in just three minutes, it introduces who Geralt truly is. Geralt is tough, a bit rough around the edges, is scorned by many for not being entirely human, and fights for pennies to save people from monsters no normal man could hope to kill. However, even if he is supposed to be an unfeeling Witcher, he has a heart and truly does want to help others. He knows who or what a true monster is and that they are not always just scary looking creatures. CD Projekt Red really did get Geralt’s character down for the game, but readers can learn so much more about him in the books, especially how far he will go to protect the ones he loves and cares about most. The second element (and possibly even third) players will come across is the Curse of the Black Sun and Geralt’s title of The Butcher of Blavikan. We shall start with the Curse of the Black Sun, for this is really only expanded upon in the game if one plays the Blood and Wine expansion. It is referenced multiple times that Syanna is haunted by this curse. Apparently, any girl who is born after an eclipse has horrendous mutations found within her. [xv] Thus these girls were treated like outcasts and this explains the tale Syanna tells Geralt if you choose to listen to her during the quest Beyond Hill and Dale. During this quest, Geralt also mentions Renfri to Syanna. This ties into how Geralt acquired his title of The Butcher of Blavikan. At various times throughout the game, characters will refer to Geralt as The Butcher of Blavikan and players will notice that Geralt is not fond of it. This unfortunate title was placed upon him after a massacre in the village of Blavikan… a massacre unleashed by Geralt himself. Renfri, the girl Geralt mentions to Syanna, had a somewhat similar tale to Syanna with a good helping of “Snow White” mixed in. Renfri, like Syanna, was born with the Curse of the Black Sun, meaning she was born on the night of a lunar eclipse. Anyone who was born on a lunar eclipse was believed to be cursed and were normally killed or sent away. Renfri was a princess, but because of her “curse,” her stepmother wanted her killed and hired the sorcerer Stregobor to aid in doing so. Stregobor and the stepmother sent Renfri with a huntsman out into the woods and ordered the huntsman to butcher her and bring them back her heart and liver. The huntsman did not kill her, but raped her and left her for dead. Renfri stole and killed just to survive, but Stregobor and her stepmother were on her trail and then tried to poison her with an apple seasoned with nightshade. She was saved by seven gnomes and, once she was healed, she planned to exact her revenge on her stepmother and Stregobor. Her stepmother died of natural causes, but Stregobor feared for his life and tried to run away from Renfri, hiding out in Blavikan as the village sorcerer. Renfri discovered where he was hiding and arrived in Blavikan just after Geralt. Stregobor begged Geralt to save him from Renfri while Renfri asked Geralt to not stand in her way. Geralt chose what he believed to be the lesser evil and murdered Renfri and her crew in cold blood in front of the whole village. [xvi] Believe it or not, what Geralt did actually save the whole village and other neighboring villages from Renfri’s madness, but his punishment was to carry the title of butcher by all who had witnessed what he had done. “The Voice of Reason 4” is a very memorable one before the story “A Question of Price.” From Geralt himself, readers learn all about him and the witcher trade. He speaks to the priestess Iola the whole time and talks about both of his swords, Kaer Morhen, briefly mentions the Trial of Grasses and undergoing his mutations, his first “noble deed” as a professional, and other contracts he had taken. One really cool thing Geralt mentions in “The Voice of Reason 4” is about Vesemir. In Witcher III: Wild Hunt, even though you only spend a certain amount of time with him in the game, players can easily tell that Vesemir is more than just a mentor to Geralt: he is almost like a father figure. In “The Voice of Reason 4,” Geralt tells Iola that Vesemir is his father. Why? Because Geralt never knew his real father or mother. [xviii] The game kind of expands more on their relationship as a “mentor and student/ father and son” duo while the books do touch upon it, but only really in Blood of Elves. And on another side note (I’m sorry, I most likely will go on these random tangents from time to time to refer to smaller aspects of the game I personally enjoyed), I need to mention Kaer Morhen. For a place that raised young boys who were taken from their homes to become witchers in excruciatingly painful ways to the point where most did not even survive the mutations, Kaer Morhen is beautiful. Once you finally arrive there during the quest Ugly Baby, have you ever just stood still and looked at what the game developers did? Next time you play, just stand outside of the fortress, stare at the scenery, and listen to the music score for this piece, in my personal opinion, is the most beautiful of the game. All righty, tangent is over. Back to the next story, “A Question of Price.” This story is, by far, THE most important story in The Last Wish for this is the start of Geralt and Ciri’s destiny. I don’t mean to sound cheesy, but this is the truth, and if any story about Geralt should be read to better understand both the Witcher Series and Witcher III: Wild Hunt, this is that story. Let us begin this story with a quest from the Blood and Wine expansion. During the quest The Warble of a Smitten Knight (which, from looking at it at a first glance, I could have sworn said “Smitten Kitten” – sorry, another weird side note that I still think about whenever I come to this quest), when talking to the Scribe before the tourney begins, the Scribe says that you can enter the tourney as either Geralt of Rivia or as Ravix of Fourhorn. If you chose to go as Ravix of Fourhorn, the Scribe mentions that this title came from attending a feast honoring Princess Pavetta, daughter of Queen Calanthe of Cintra. Now, if players have not read the books yet, they may be wondering where Geralt inherited this name from. “A Question of Price” is where they shall find the answer. Ravix of Fourhorn was the alias bestowed upon Geralt by Queen Calanthe of Cintra during her daughter’s birthday. Queen Calanthe was Ciri’s grandmother and her daughter, Princess Pavetta, was Ciri’s mother. Queen Calanthe hired Geralt to attend her daughter’s fifteenth birthday undercover, for it was also a day to find her daughter a husband. The Queen knew there was a particular man pursuing her daughter and hoped Geralt could stop him from getting to her. This man was considered to be a beast, almost resembling a hedgehog or an urcheon, and was said to be cursed. Geralt was unable to keep this urcheon, or Duny as he called himself, away from Pavetta and Duny said that Pavetta is his due to the Law of Surprise. This Law is also mentioned in Blood and Wine during the first quest The Beast of Toussaint. Anna Henrietta asks Geralt, “Are the legends true? Do witchers usually demand ‘that which you find at home, yet did not expect?” What Anna Henrietta asks is exactly how one would invoke the Law of Surprise. This is how witchers would acquire young boys to endure the witcher mutations and also how Geralt acquired Ciri. We will focus on this in a moment. Let us next focus on another element that may have confused players during one specific quest: The Battle of Kaer Morhen. Once again, spoilers ahead. 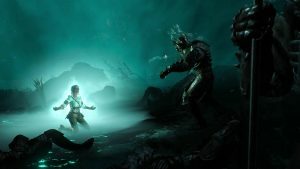 As I mentioned earlier, I will try to remind people who have yet to read and/ or play the game, but there will be spoilers abound in these articles. Towards the end of the quest, after Imlerith kills Vesemir, Ciri unleashes a scream that nearly kills not only the Wild Hunt, but her comrades, as well. This seems to be an unknown power that is a result of carrying the Elder Blood for Ciri’s mother, Princess Pavetta, unleashed the exact same scream during her birthday. When Duny revealed himself and his rights for invoking the Law of Surprise to have Pavetta as his wife, Queen Calanthe wanted nothing to do with him and ordered him to be, I believe, either arrested or killed. Pavetta, consumed by grief for possibly losing the man she loved, unleashed a scream unlike anything any of the guests had ever witnessed. Her scream nearly wiped out all of the guests, including her own mother and her love. Geralt played a big rolein getting her under control. Pavetta and Duny received Queen Calanthe’s blessing and were able to be together and asked what they could do to repay Geralt for all he had done for them. Geralt issued the Law of Surprise on them and, it turned out, that Pavetta was pregnant. Geralt had issued the Law because he believed they would have a boy. Little did he know that Pavetta was pregnant with a girl: Ciri. There is actually another reference to this story in the Witcher III: Wild Hunt story line that I missed the first few times I played through it. When trying to find Dandelion in Novigrad, you come across the quest The Play’s The Thing. The play Priscilla writes is actually a comical rendition of the union of Pavetta and Duny. One of the main reasons this story is so important is the fact that Dandelion is introduced for the first time to the readers. 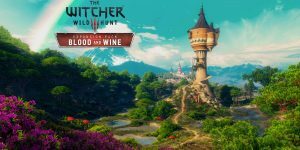 If one has only played the games, they have, of course, been introduced to the Witcher’s troubadour friend; however, in Witcher III: Wild Hunt, during the entirety of the quest Broken Flowers, players are introduced to just how much Geralt goes through being friends with Dandelion. The Witcher is constantly having to save the troubadour and the books give a taste to just how many times Geralt has saved Dandelion’s life, but Dandelion has also saved Geralt, as well. While I like to see their friendship similar to that of Shrek and Donkey, both men would go through hell if it meant saving the other one. “The Edge of the World” is an excellent introduction to the relationship between Geralt and Dandelion and there are a couple references to this story within Witcher III: Wild Hunt. The first can be found during the aforementioned quest Broken Flowers. When you first speak with Zoltan and try to find some sort of clue as to where Dandelion is in the Rosemary and Thyme, you will come across a lute lying on the floor. 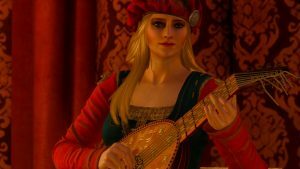 Geralt asks Zoltan if it is the lute Dandelion got from the elves in Dol Blathanna and Zoltan says that Dandelion must have been in a great rush to leave it behind. Dol Blathanna is mentioned multiple times in the books, but for this particular story, this is exactly where Dandelion received his famous lute. Geralt and Dandelion were captured by the elves of Dol Blathanna and said elves broke Dandelion’s original lute. As a sort of peace offering come the end of the story, the elves offer him a lute one of them was carrying that Dandelion kept admiring, saying it sounded like the strings were alive and that the wood sang on its own. [xix] The lute you find in the game is this very same lute that Dandelion cherished and carried throughout the book series. Aside from Dandelion’s lute and the elves, there is a creature that takes center stage during this story: a Sylvan. One Sylvan can be found in the game at an explanation point in Velen a little ways west of Oreton. Upon finding some gentleman at some ruins who are praying to their “Allgod” to lift a curse he bestowed upon them, you will unlock the short side quest A Greedy God. Here, you will find a Sylvan hiding in a basement pretending to be a godlike deity to receive food and offerings from poor villagers. This refers to “The Edge of the World” for Geralt and Dandelion’s whole mess involving the elves begins with a Sylvan named Torque (though the Sylvan found during A Greedy God is a lot bigger than Torque. Maybe he just ate too much, but in the story, Torque is probably the size of a large goat that stands on its back legs). 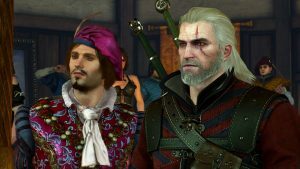 When Geralt and Dandelion arrive in a village, the villagers complain about a devil that had been causing them problems by stealing their crops and food. Torque was this “devil” and certainly gave Geralt and Dandelion a run for their money. Torque was stealing food to give to the elves of Dol Blathanna and believed he was doing nothing wrong. He even defended Geralt and Dandelion when the elves planned to kill the Witcher and troubadour. During the quest Big Game Hunter in the Blood and Wine expansion, speak with Count Beledal at the end of the quest and ask about his daughter Clarrisa. The Count talks about possibly passing through Dol Blathanna for it is said you can see Sylvans there. Geralt mentions that he knows one named Torque and to send him his regards if the Count should see him. 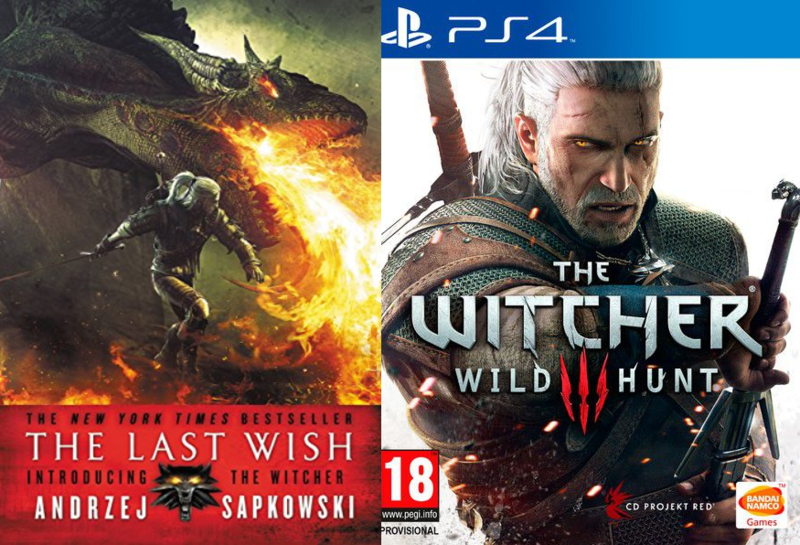 The title of Sapkowski’s first collection of short stories as well as the quest by the same name in Witcher III: Wild Hunt, The Last Wish is a very important quest to complete in the game if you wish for Geralt and Yennefer to be together… as it should be. 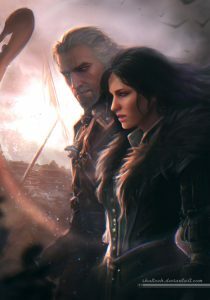 If players read any other short story in this collection aside from “A Question of Price,” read “The Last Wish” for this story shows how Geralt and Yennefer met and how they are bound to one another. I don’t want to delve too deep within this story because it is one to be enjoyed by readers and players alike. I will touch on certain important aspects while the rest should be enjoyed on one’s own. “The Last Wish” is a wonderful story that is both funny and heartfelt at the same time. The quest of the same name is just as enjoyable whether players have read the story first or not. In “The Last Wish,” Dandelion winds up catching a Djinn in a jar he pulls from the river while he and Geralt are fishing for dinner. When trying to make all three of his wishes at once, the Djinn attacks Dandelion and takes his voice after wish number two. Desperate, Geralt takes Dandelion to the nearest village where there is a sorceress that could help him. The sorceress, Yennefer of Vengerberg, agrees to help the troubadour reclaim his voice… for a small fee from the witcher, of course. After defeating the Djinn come the end of the quest, if you chose for Geralt to say, “We beat the djinn,” he mentions that they have improved since the last time they faced off against a djinn, they destroyed half of Rinde. Rinde was the city where Yennefer was staying when Geralt sought out her help. As soon as she discovered Geralt and Dandelion had a Djinn, she wanted to control it and make a wish for herself, the final wish Dandelion was unable to make before losing his voice. The Djinn, like the battle you fight in The Last Wish quest, does not like to be contained and puts up quite the fight to be free, truthfully destroying half of Rinde in the process. It is during this first fight in the story that Geralt uses the last wish to bind him and Yennefer together forever. During their fight against the Djinn in the game, it is Yennefer’s turn to make a wish; however, she wishes to break the bond the first Djinn cast to see how her and Geralt will be when free. I have to admit, this broke my heart the first time I played through it. While reading the series, I was always a fan of Yennefer and Geralt because I personally believe that those two belong together. When I discovered they still could be together come the end of the quest based on the player’s decision, I felt much better. I am going to apologize ahead of time for I am a strong believer in Yennefer and Geralt because, in all honesty, they do belong together (and I may repeat myself as I just did from the previous paragraph…). Sapkowski referenced Triss and Geralt having a small fling in the series, but never expanded upon it other than Triss wanting to be where Geralt was or wanting to be with him. CD Projekt Red was the one that expanded on that relationship through the first two games and, to be completely honest, I am not a fan. Of course, this is my personal preference and I encourage everyone to back whichever couple they like best, but I will be backing Yennefer and Geralt during all of my articles (just a heads up to Triss and Geralt fans out there… sorry). A couple other references to “The Last Wish” can be found in the game other than the actual quest. Players will notice that Geralt calls Yennefer “Yen” throughout most of the game. He is the one and only person to ever call her by that nickname. [xxi] As a more subtle hint to the story, you can actually find a copy of the book The Last Wish in Yennefer’s room at the inn on Ard Skellige by Kaer Trolde. Players can find a very brief retelling of Sapkowski’s story in this little book, but it is not the same as reading the actual story. And last, but not least, Priscilla’s famous song that she performs during Broken Flowers is all about “The Last Wish.” Every player was captivated by the “Wolven Storm” the first time they heard it and I will most certainly admit that I was very excited when I realized the lyrics were about Geralt and Yennefer. It is absolutely gorgeous and talks about how they first met and their tie to one another. “I know not if fate would have us live as one. Or if by love’s blind chance we’ve been bound. The wish I whispered when it all began. Did it forge a love you might never have found?” These lyrics that are heard towards the end of the song describe their relationship perfectly. Both were alone in the world and found love in one another. Again, please, just read their story for I cannot even put into words the pair Sapkowski created in Geralt and Yennefer. Hey, you all survived my first article! Yes, I know, this one was long and I did not realize how much I wrote until after I was done… Oh, well. I did warn you all and I will continue to warn you that I do have a tendency to ramble. I also noticed that I give synopses of stories or scenes when I can to explain certain parts of the story. This will also happen in the articles to come mainly because I want to give some backstories to those who have played the games, but have not read the book series. I hope that by talking about the books, it helps to explain more to the players and maybe even gets them excited to read the books themselves for Sapkowski is to be commended for the amazing fantasy world he has created. I will keep my conclusions short for I know I have talked your ears off for the day. Be sure to check in tomorrow, September 19, for my next article about the references found in Sapkowski’s second collection of short stories Sword of Destiny. Until then, everyone have a wonderful day! Sapkowski, A. (2017) The Last Wish. New York, NY: Orbit Books. Kandel, M. (2010) A Polish Book of Monsters: Five Dark Tales from Contemporary Poland. New York, NY: PIASA Books.